This article is about the Town of Groton. 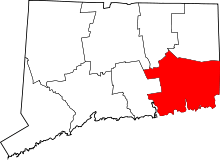 For the City of Groton located within the town, see Groton (city), Connecticut. Groton /ˈɡrɒtən/ is a town located on the Thames River in New London County, Connecticut, United States. The population was 40,115 at the 2010 census. Groton is the home of the Electric Boat Corporation, which is the major contractor for submarine work for the United States Navy. The Naval Submarine Base New London is located in Groton, and the pharmaceutical company Pfizer is also a major employer. The Avery Point section of Groton is home to a regional campus of the University of Connecticut. Groton was established in 1705, when it separated from New London, Connecticut. Groton is the home of General Dynamics Electric Boat Division, which has been supplying the Navy with submersibles since 1899. Electric Boat employs thousands in the Groton/New London area, but since the end of the Cold War, it has laid off many workers. The Old Mystic Baptist Church, founded in Groton, was the first Baptist church in Connecticut. A hundred years before the town was established, the Nehantic people settled in the area between the Thames and Pawcatuck rivers. The Nehantics were brutally attacked by the Pequots. These invaders burned their wigwams, destroyed their cornfields and food supplies, and a few possessions were stolen. Many of the Nehantic warriors were tomahawked. The survivors fled to Misquamicut in what is now Rhode Island, United States. 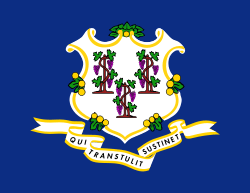 The newcomers to the land were the Pequots, a branch of the Mohawk people who moved eastward into the Connecticut River Valley, displacing existing settlements of indigenous peoples. The Pequots finally rested and made their headquarters in what is now Groton. They built three villages at Groton Heights, Fort Hill, and Mystic. The Pequots made canoes from burning out the insides of straight tree trunks. The rivers in Groton were their transportation routes; on the west side was the deep Thames River; on the east is the Mystic River with shelving shores and a safe anchorage. On the south was Fishers Island Sound, part of Long Island Sound, rimmed by a ragged, rocky shoreline with many coves and inlets, and three sandy beaches at Eastern Point, Bluff Point, and Groton Long Point. Between the rivers, the land was undulating and rough, with the exception of Poquonnock Plains in the center, which was a smooth stretch of land that went to the sound. The summer of 1614 was the first time that the Pequots encountered white settlers. They started trading furs for the settlers' goods, such as steel knives, needles, and boots. In 1633, the Dutch bought land from the Pequots and opened a fur trading post. Meanwhile, the English bought land for settlement from the local tribes. The Dutch had unintentionally killed the Pequots' chief, and this prompted revenge by the Pequot tribe, who then attacked. Soon after, Sassacus, the new leader of the Pequots, realized that they were in grave danger because both the English and the surrounding Indians hated them. The first settlers of Groton were subsistence farmers. Trees had to be removed before they could work the ground. Livestock was also very important to the settlers. Cattle provided dairy; pigs and sheep provided animal protein and wool; and oxen did the heavy farm work. In 1660, gray wolves in the area had become such a problem that the settlers offered to give 20 shillings for each wolf that was killed. Though the land was poor, access to the region's waterways left room for commerce and trade. Groton became a town of oceangoing settlers. Most of the community began to build ships, and soon the first traders made their way to Boston and Plymouth to trade for food, tools, weapons, and clothing. John Leeds was the earliest shipbuilder, coming as a sea captain from Kent, England. Leeds built a 20-ton brigantine, a two-masted sailing ship with square-rigged sails on the foremast and fore-and-aft sails on the mainmast. Thomas Starr built a 67-ton square-sterned vessel, and Thomas Latham launched a 100-ton brig on the Groton bank with mast standing and fully rigged. The sturdy ships built in Groton engaged in very profitable trade with the islands of the Caribbean. Many ships and their contents were lost due to storms, but the profit was worth the risk. Rough times came to the Connecticut town of Groton when the French and Indian War ended and the Sugar Act of 1764 and the Stamp Act of 1765 were passed. Parliament closed down the port of Boston, crippling Groton's commerce. On September 6, 1781, the Revolutionary War Battle of Groton Heights was fought between a small militia detachment led by William Ledyard and numerous British forces led by Benedict Arnold. No one at Fort Griswold had expected an attack, especially after six years of false alarms. At sunrise, a force of 1,700 British regulars landed on both sides of the mouth of the Thames River. The British fleet had sailed from Long Island the evening before, and only a sudden shift in the wind prevented a surprise attack during the night; it was 9 a.m. the next day before the transports could come ashore to land the troops. Across the Thames River in New London, Benedict Arnold was leading an 800-man detachment which destroyed stockpiles of goods and naval stores. Arnold had been unaware of the orders given to spare most of the town. He was also unaware that one of the ships docked in New London was filled with gunpowder. Upon ignition, the ship burst into flames and created an uncontrollable fire which destroyed 143 buildings in New London. ...the wretch who murdered him [Ledyard], exclaimed, as he came near, "Who commands this fort?" Ledyard handsomely replied, "I did, but you do now," at the same moment handing him his sword, which the unfeeling villain buried in his breast! Oh, the hellish spite and madness of a man that will murder a reasonable and noble-hearted officer, in the act of submitting and surrendering! 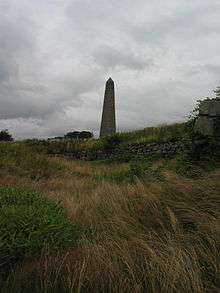 A memorial for the Battle of Groton Heights was put up in 1830 for the 88 men and boys who were killed at the fort. Fort Griswold is the only intact memorial in town left from the Revolutionary War. The 135-foot-tall (41 m) monument has become the town's symbol and is now featured on the Groton town seal. Monument erected in 1830 commemorates the American troops massacred by the British following the surrender of Fort Griswold in the Battle of Groton Heights during the American Revolution. Shortly after the Revolutionary War, Groton started to re-establish its commercial activities. Shipbuilders began to build again; Victory was launched in 1784, Success was launched in 1785, and five sloops were built in 1787, along with the 164-ton Nancy. Shipbuilders along the Mystic River were the busiest. These ships went on trips to Florida, and the resulting profits made Mystic the most thriving part of the town. Between 1784 and 1800, 32 vessels were built in Groton. 28 more were built from 1800 to 1807, when business came to a sudden stop with the Embargo Act. In June 1812, the United States declared war on Great Britain. Most of the United States' small navy was landlocked in the Thames River. This frightened the people in Groton for fear that there would be a repeat of the Groton Heights massacre of 1781, and many residents fled inland for safety. Those that didn't flee demanded protection and militia. These residents built a fort on a hill of rock that held one cannon and maintained constant guard. The fort was named Fort Rachel, after a woman that lived nearby. The British never attacked but created a blockade that ruined Groton's trade. Some men from Mystic lured a British barge to Groton Long Point on August 12, 1814, the day after the British attacked Stonington, gaining themselves 2,600 dollars in prize money. The men in Mystic captured a sloop, the cargo of which they later sold for 6,000 dollars. Seventeen Mystic men also tried out a new weapon called the spar torpedo to rid themselves of the British blockade. They brought the torpedo from New York; it was 30 feet (9 m) long, 7 inches (18 cm) in diameter, and had a 12-foot (4 m) crossbar at one end. The men failed to sink the HMS Ramillies. On their first attempt, the torpedo went into the water; on the second attempt, the explosive caught on the Ramillies’ cable and exploded. 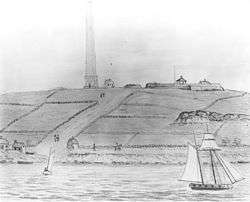 All the men made it safely to the shore while being fired at by the British ship and the American sentries at Eastern Point. Groton received word that the war was over on February 21, 1815. The land-locked frigates left the Thames in April, leaving Groton to resume its marine pursuits. After the War of 1812, whaling became a very important part of Groton's economy, but most of the expeditions were still for seal skins. Before 1820, sealers went to Antarctica, where their ships would drop them off. They would kill the seals and then prepare the skins for some weeks, until their ship returned for them. By 1830, whaling had become Mystic's main business. By 1846, Groton became one of the world's prime whaling ports. Whaling was difficult and dangerous, but boys would go out to sea to make their fortune, nonetheless, in the hope that some of them would eventually come to command a vessel. In 1865, Ebenezer Morgan made one of the most profitable voyages. He sold his cargo for $150,000. Three years later, he raised the first American flag on Alaskan territory, and there he collected 45,000 seal skins. When he retired, it was said that his estate totaled up to $1 million. William H. Allen, another son of Groton, spent 25 years commanding a whale ship. Old sailors said that "whales rose to the surface and waited to be harpooned." When he retired, he spent 12 years working as a selectman. In 1849, the discovery of gold in California created a demand for speed that resulted in the creation of the clipper ship, a fast sailing ship with multiple masts and a square rig. The most important vessel built at the Mystic River Shipyard was the clipper ship Andrew Jackson. In 1859, it sailed from New York City to San Francisco in a record time of 89 days and 4 hours. Both clippers and sailing packets were built in the shipyards of the Mystic River at that time. The Mystic shipyards started building ships with a greater cargo capacity after the Civil War. Gideon Welles, Secretary of the Navy during the Civil War, wanted three experimental ironclad steamers to be built in private shipyards and used against the Confederacy's wooden fleet. A company in Groton was chosen to build a bomb-proof steamer designed by C.S. Bushnell of New Haven. 100 men were hired, and a big shed was built so that construction could continue rain or shine. The ship was ready for launching in 130 days. There were many skeptics who believed that the ship would sink or corrode once it hit the salt water, and there were very few who thought that it might float. Thousands came to watch Galena's launch on Valentine's Day 1862. Reporters commented that she floated like a duck. When it came time for the Galena to enter battle, she was pierced 13 times. Thirteen of the crew members were killed and 11 were wounded from flying metal fragments. During the Civil War, 56 steamships were built for government service in shipyards on both sides of the Mystic River. After the war, there were dozens of excess war steamships and, after 1870, shipbuilding moved up to Noank within the Groton town limits. One of the largest shipyards was Palmer Shipyard, established in Noank in 1827. A marine railway built in Groton in 1860 allowed them to pull vessels out of the water for repairs, which brought in a lot of business and money. The shipyard was running up to 1913 when one of the Palmer brothers died, but during World War I the shipyard was used again. Iron ships began to be demanded, and their construction attracted workers to Groton. 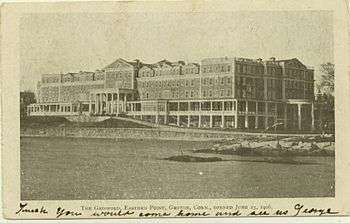 Housing was beginning to run short, so Groton Realty had to hurry to build hotels and cottages. The ships which brought the workers in turn also brought more business to the Realty. The Naval Submarine Base New London was founded in Groton in 1872 as the New London Navy Yard. Submarines were first based there in 1915, and in 1916 it was officially renamed a submarine base. Groton used to include what is now the town of Ledyard, which separated from Groton in 1836. The original center of Groton is still known as Center Groton at the present-day intersection of Route 184 and Route 117, now in the north-central part of town, due to the departure of Ledyard to the north. Groton Center was the location of the town's first school, church, tavern, and stagecoach shop. In the 20th century, the shipbuilding industry moved from the Mystic River to the Thames River. Electric Boat is the town's largest employer. 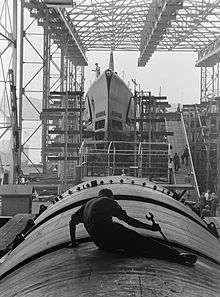 However, until 1931, submarines designed by Electric Boat were subcontracted to other shipyards, primarily Fore River Shipbuilding in Quincy, Massachusetts. Electric Boat commenced industrial operations in Groton with the establishment of the New London Ship and Engine Company (NELSECO) as a subsidiary in 1911. NELSECO was the primary engine manufacturer for Electric Boat-designed submarines 1911–1925. In 1931, the USS Cuttlefish was laid down as the first submarine built in Groton. During World War II, Electric Boat completed submarines every two weeks. The Groton and Stonington Street Railway was a trolley line that was created in 1904 to serve the Groton area. The trolley was dismantled and replaced by buses in 1928. There are two major companies in Groton: General Dynamics Electric Boat and Pfizer. The Electric Boat plant on the eastern shore of the Thames River employs 10,500 people in the community. Pfizer is one of the world's largest pharmaceutical companies, and the company maintains a 137-acre (0.55 km2) research and development facility in Groton. According to the United States Census Bureau, the town has a total area of 45.3 square miles (117.3 km2), of which 31.0 square miles (80.4 km2) is land and 14.2 square miles (36.9 km2), or 31.47%, is water. Other minor communities and geographic features are Bluff Point, Eastern Point, Esker Point, Jupiter Point, Mumford Cove, and West Pleasant Valley. As of the census of 2000, there were 39,907 people, 15,473 households, and 9,980 families residing in the town. The population density was 1,275.2 people per square mile (492.3/km²). There were 16,817 housing units at an average density of 537.4 per square mile (207.4/km²). The racial makeup of the town was 83.61% White, 6.95% Black or African American, 0.83% Native American, 3.33% Asian, 0.17% Pacific Islander, 1.66% from other races, and 3.45% from two or more races. Hispanic or Latino of any race were 5.01% of the population. There were 15,473 households out of which 33.4% had children under the age of 18 living with them, 50.5% were married couples living together, 10.5% had a female householder with no husband present, and 35.5% were non-families. 29.2% of all households were made up of individuals and 9.5% had someone living alone who was 65 years of age or older. The average household size was 2.41 and the average family size was 2.99. In the town the age distribution of the population shows 24.8% under the age of 18, 11.8% from 18 to 24, 33.0% from 25 to 44, 18.3% from 45 to 64, and 12.1% who were 65 years of age or older. The median age was 32 years. For every 100 females there were 104.7 males. For every 100 females age 18 and over, there were 105.5 males. The median income for a household in the town was $46,154, and the median income for a family was $51,402. Males had a median income of $36,204 versus $30,255 for females. The per capita income for the town was $23,995. About 4.9% of families and 6.1% of the population were below the poverty line, including 8.0% of those under age 18 and 6.1% of those age 65 or over. There are many schools in the Groton area. Groton Public Schools currently include 11 schools, but there are plans to consolidate the three middle schools into two middle schools. In 2012 Fitch Middle was closed. Captain James Avery (1620–1700), captain of the New London militia company during King Philip's War. Morgan Point Light is located in Noank in southeastern Groton. ↑ "Town Council" (PDF). Groton, CT. Retrieved 20 December 2015. 1 2 3 "Profile of General Population and Housing Characteristics: 2010 Demographic Profile Data (DP-1): Groton town, New London County, Connecticut". U.S. Census Bureau, American Factfinder. Retrieved October 25, 2012. ↑ "National World War II Submarine Memorial – East". California Center for Military History. Retrieved 29 October 2011. ↑ Kimball, Carol W. Historic Glimpses: Recollections of Days Past in the Mystic River Valley. Mystic, Connecticut: Flat Hammock Press, 2005. ↑ Town of Groton CAFR. Retrieved 2011-05-30. ↑ "Geographic Identifiers: 2010 Demographic Profile Data (G001): Groton town, New London County, Connecticut". U.S. Census Bureau, American Factfinder. Retrieved October 25, 2012. ↑ "Registration and Party Enrollment Statistics as of October 25, 2005" (PDF). 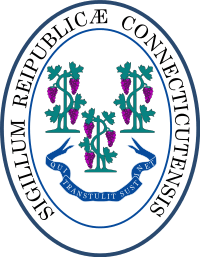 Connecticut Secretary of State. Archived from the original (PDF) on 2006-09-23. Retrieved 2006-10-02. Rathbun, Jonathan; Avery, Rufus; Hempstead, Stephen; Herttell, Thomas (1971). Narrative of Jonathan Rathbun: With the Narratives of Rufus Avery and Stephen Hempstead, Including the Narrative of Thomas Herttell. New York: Arno Press. ISBN 978-0-405-01217-4. OCLC 138565.